To appreciate this joke better, please go over to Cheerful Monk’s blog post Time Machine first. Please also read all the comments there. 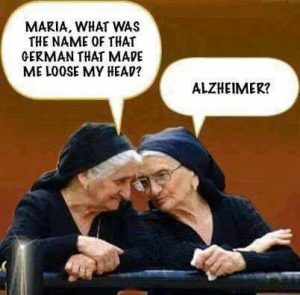 This entry was posted in Blogging, Humor and tagged Alzheimers. Bookmark the permalink. 9 Responses to Growing Old! I’m not old yet! Wait, how old AM I? Age doesn’t matter. It is just a state of mind. If you don’t mind, it doesn’t matter. It doesn’t matter at all indeed. I am glad that you are enjoying them Catherine.